Product prices and availability are accurate as of 2019-04-21 22:58:56 UTC and are subject to change. Any price and availability information displayed on http://www.amazon.com/ at the time of purchase will apply to the purchase of this product. 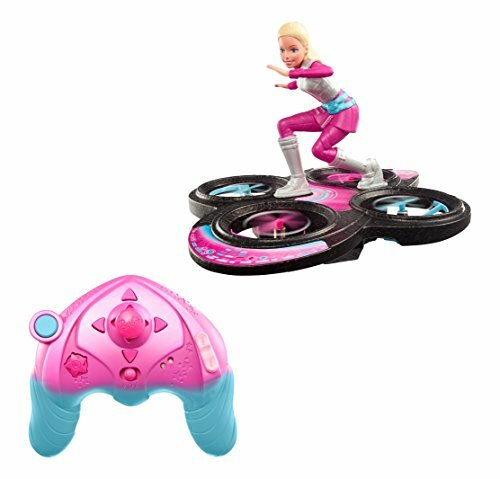 Once your little girl has seen the Barbie Star Light Adventure movie she is going to want the Barbie Star Light Adventure Flying RC Hoverboard Doll that works in a similar fashion to the quadcopter and drones that you are already seeing everywhere these days. Barbie has been rebooted as a cosmic princess in Barbie Star Light Adventure and she teams up with a group of hover boarding friends to save the Galaxy. Barbie is boldly going where no Barbie has ever gone before! Who Would Buy A Barbie Remote Control Hoverboard? The manufacturers recommend it for ages 8 and over and with parental supervision. I'm guessing that it will appeal to children of a younger age as well. First up we liked the look of this toy, the matching blue and pink colors for the hoverboard, remote control and Barbie's clothes are well designed. The actual hoverboard and remote control seem easy to use and as well as going up and down and in all four directions it has all buttons for instant take-off and landing. The hoverboard also has preset buttons for three different stunts. The unit is charged by an included USB Cable. Drones and quadcopters are notorious for being difficult to control but this has been well designed to be easily controlled by a novice. 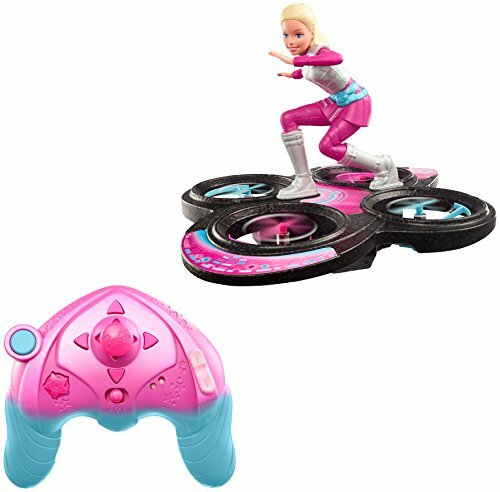 Until the Barbie Star Light Adventure Flying RC Hoverboard Doll is released later this year, we won't know of any design faults. One thing we didn't really like is that Barbie can't be removed from the hoverboard it would add some extra creative play to the set but saying that there are probably design reasons why this is so. The actual Barbie is made of lightweight foam, which makes sense otherwise she would be too heavy for the hoverboard to fly. Watching the video from the Toy fair, the hoverboard does seem fairly noisy but quadcopters usually are so this isn't a big surprise. There's has been no mention of how long it flies for before needing to be recharged. This is something that we'd like to know. The Barbie Hoverboard is priced at around $80 by many retailers, however Amazon, (my favorite online store) has it for sale for much less. For Barbie fans old and new this is likely to be a 'must have' and will be a big seller once the movie is seen and will certainly be on a lot of girls Christmas toy lists. The hoverboard looks pretty durable and we are sure it has been rigorously tested so it should be worth the price tag. Barbie is getting a big makeover this year and this Science Fiction, cosmic Barbie is a pretty brave move. We welcome this futuristic new Barbie and think the RC Hoverboard will be massively popular with all Barbie lovers. Based on the space fantasy movie Barbie Star Light Adventure, this working RC Hoverboard with Barbie doll rider on top is truly out of this world... because it really flies! Practice all kinds of flight maneuvers to perfect your Barbie doll's flying skills, and get started with three pre-set flying stunts for cool tricks that soar right out of the box! The Barbie figure (non-removable) is ready to fly into futuristic tales wearing her signature pink jumpsuit featured in the movie. The innovative remote-controlled hoverboard brings the hoverboarding action seen in the movie to life for high-flying fun. Recreate the exciting action of the galactic tale in which Barbie embarks on an adventure throughout the galaxy... training, saving the universe and traveling. Help her practice and complete her mission by taking control of the action. It's so easy to operate with one-button maneuvers and simple mechanisms! The colorful shimmery remote features an easy-to-use joystick and a simple sliding lever to adjust the flying height. Four propellers work to lift the hoverboard into the air, control the direction and complete amazing stunts. Automatic launch and land features make take-off and landing simple with just one easy press of a button. Practice all kinds of flight maneuvers to perfect your Barbie doll's flying skills, and get started with three pre-set flying stunts for cool tricks that soar right out of the box! 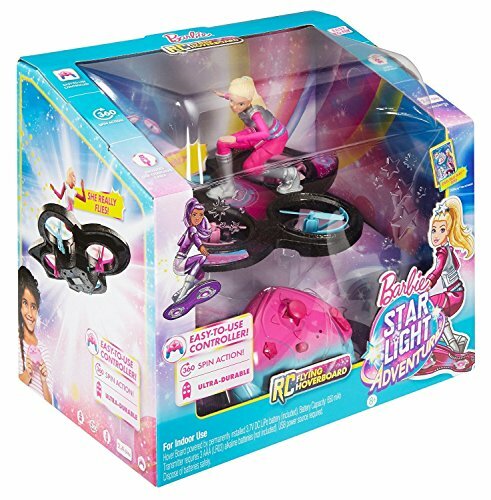 Bring the out-of-this-world fun to life with the RC Hoverboard and Barbie figure based on the galactic movie Barbie Star Light Adventure! Auto-launch, auto-land and three pre-set flying stunts let imagination soar right out of the box! Four propellers work to lift the flying toy into the air, control the direction and complete amazing stunts per your command!